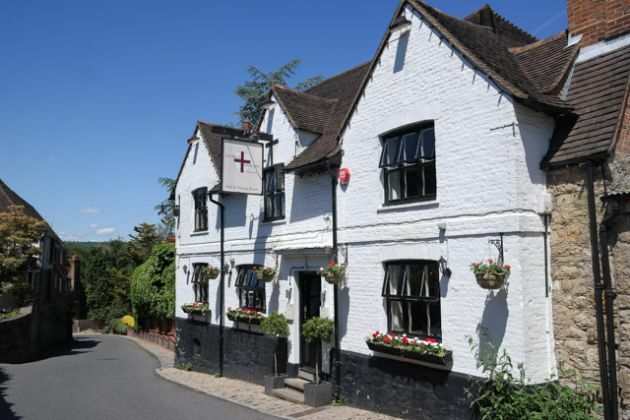 I had been trying to get a booking for Sunday lunch at The George and Dragon in Chipstead for a few weeks, but they were always full (a good sign, I suppose). I got lucky one weekend in June and booked a table for 2 adults and 1 child. They are situated in a quintessential English village, with lots of grass areas and beautiful houses. The car park for The George and Dragon was quite small, so we had to park along the road further up from the pub. The venue itself was a beautiful old building, with a garden, patio and children’s play area at the back. Whilst it was a warm and sunny June day, as we had JW with us, we decided to eat indoors. There were a couple of fireplaces with lights around logs, and a comfy looking settee with papers. The table was laid out with linen napkins (a touch I always appreciate). Gentle music playing through a stereo – essentially somewhere I was pleased I booked! I ordered a guest ale, Claire asked for a white wine. A cappuccino was ordered by me to finish too! Claire ordered the Heritage Tomato Salad, I ordered the rillette pork. 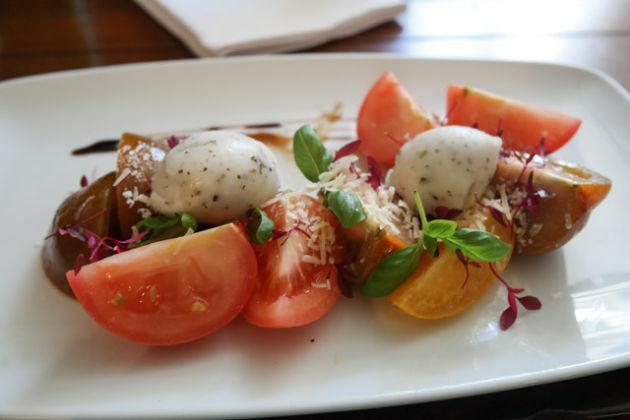 Our starters came out quickly – I do not eat salad but even I was impressed with Claire’s starter, so many different types of tomatoes and even a basil sorbet! Claire remarked how Summery the dish was and really liked it. 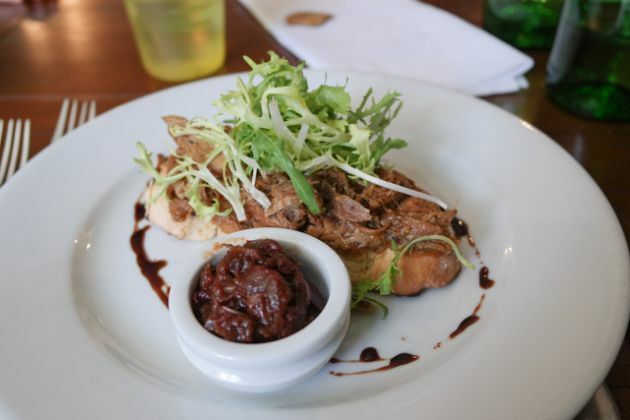 My pulled pork rillette, with a very nice chutney, was excellent. 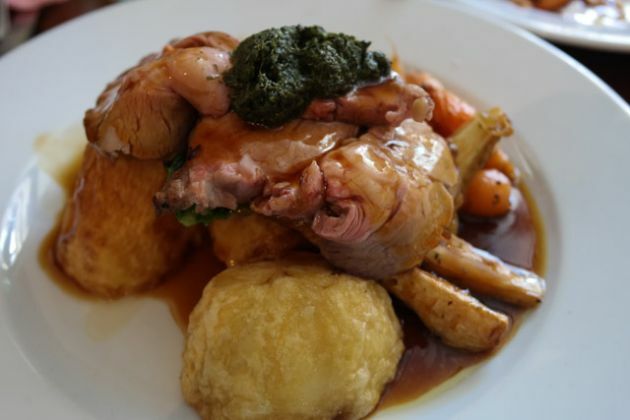 Claire had ordered the roast lamb (and asked how would she like it cooked – a first and definitely a plus point). I ordered the roast beef, medium rare. JW’s meal, sausages and roast potatoes, came out with the starter (to keep him occupied). Our main courses came out fairly soon after finishing our starters. The plates were served, with two thick slices of meat, kale, carrots, parsnips and a yorkshire pudding (with the beef). A waiter then poured our gravy for us. JW’s meal was perfect for him – just the right kind of size to keep him full (and vegetables to keep us happy with nutrition). 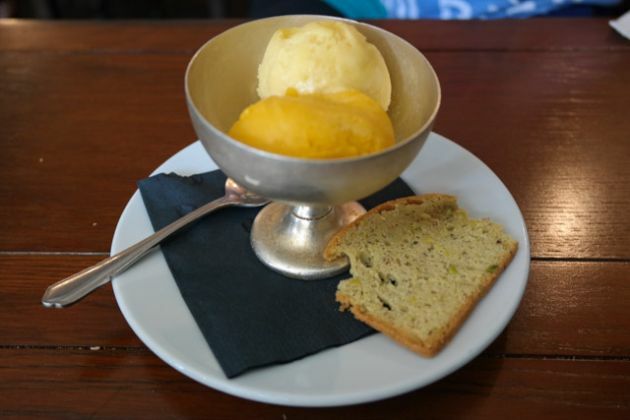 Claire ordered a mango and blood orange sorbet for her and JW to share. 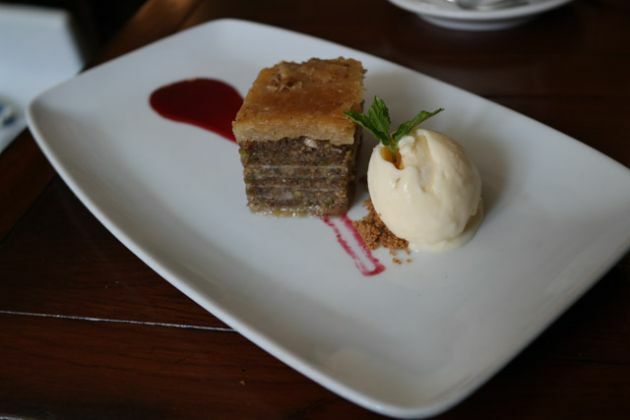 I normally go for a cheesecake or sticky toffee pudding, and wanted to try something different – the filo pastry sounded interesting, so I ordered one of them. I was very pleased with my choice, it looked fantastic and tasted wonderful – extremely sweet! Claire, whilst jealous of my dessert, did enjoy the sorbet. A clean and sturdy highchair was brought out for JW to use when we first arrived. 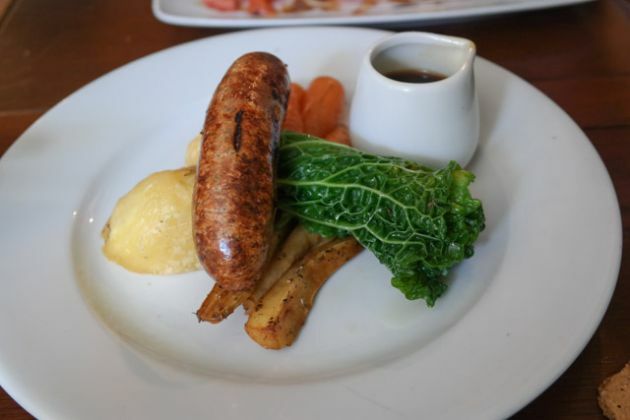 Food-wise, The George and Dragon had a good children’s menu (and he ate quite a bit of his meal). It was higher priced than I normally like to spend, being £7.50, but it helped to know that the food was reasonably sourced and good quality (they try and use organic produce if possible). They didn’t have any baby changing facilities, although Claire was told most people use the shelf in the ladies (she couldn’t find it). Outside, they had a large play area for children which he (and I) enjoyed. Overall, I’d say it was suitable for families with young children. I had high hopes for The George and Dragon on Chipstead after all the chatter on Twitter, and I am pleased to report they exceeded them. The service was excellent, always on hand to help whilst not being intrusive. The venue felt homely and somewhere one could relax in for hours. The (mostly organic) food was excellent, from the Summery starters through to the superb Sunday roast and the desserts. Children facilities were good, including a large garden and play area. 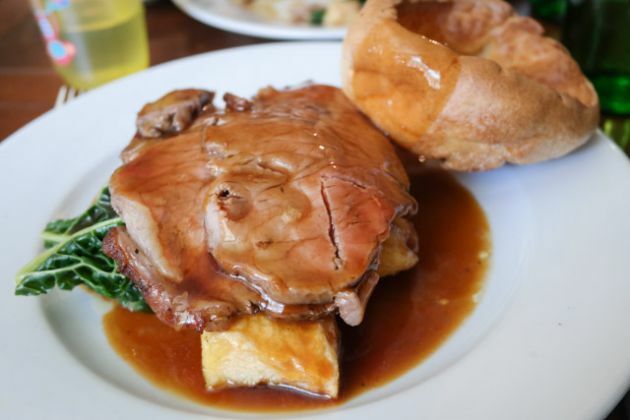 So, overall an excellent Sunday roast at The George and Dragon in Chipstead, Sevenoaks, suitable for families and couples alike.